My favorite is the last one. Absolute perfection in my book. 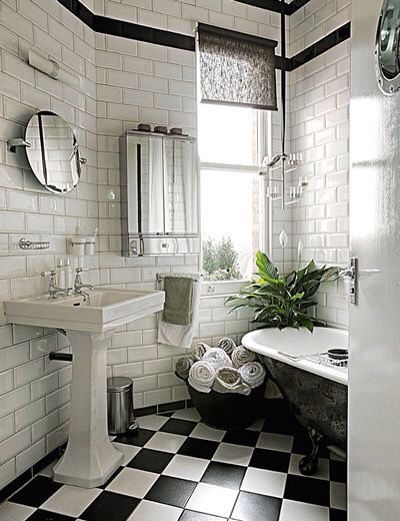 After taking stock of my Pinterest board, it was pretty clear that we’d be going with black and white, subway tile, checkerboard floor and vintage fixtures. 1) It had to be done on a budget (no-brainer for us). 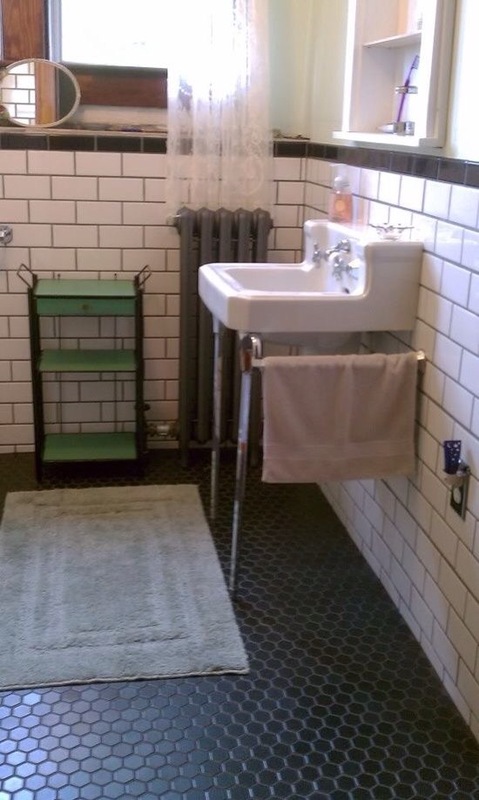 We would reuse the tub, find a free vintage farmhouse sink, and another vintage sink on Craigslist. 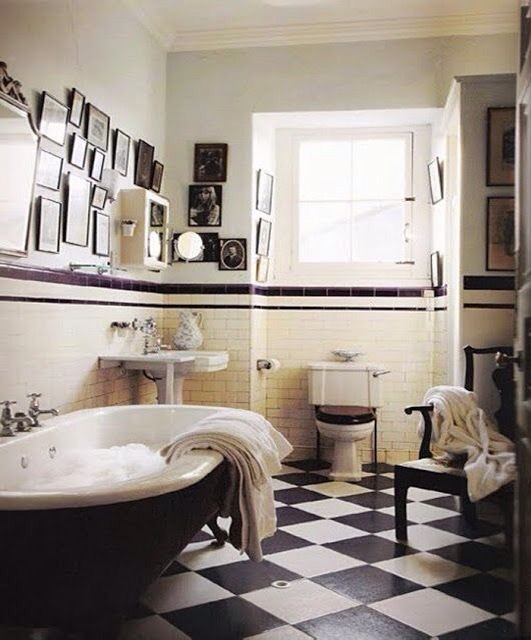 Tile had to be cheap (but also look amazing). We would do nearly all the work ourselves. 2) It had to be functional for our family of five. Lance (Mr 6’3″) wanted a shower big and tall enough for him. He was D.O.N.E. with the shower curtain surrounding the clawfoot tub situation. We wanted to have 2 sinks so that more than one person could be grooming at one time. The ultimate goal is for us to live in this house forever, and so it our one and only full bathroom really needed to accomodate us to the max. 3) Laundry Room. The bathroom had to fit a washer and dryer. I kind of wish we didn’t have to ugly up the room with it, but we really needed to. Why? We really wanted to use the room on the mainfloor that had housed the laundry room as a powder room (DIY project, coming Winter 2016). By making this room the powder room, this allows me to remove the toilet from my butlers pantry (toilet + food prep= BAD idea). I can’t wait to reclaim the butlers pantry area for what it was origianally intended for (DIY project #2- coming 2016). What about the basement? Again, my 6’3″ hubby put his foot down. He has to practically crawl down the basement stairs to avoid hitting his head and so he was not up for keeping the laundry room down there. So you see, I had no choice but to move an ugly washer dryer (budget, remember?) 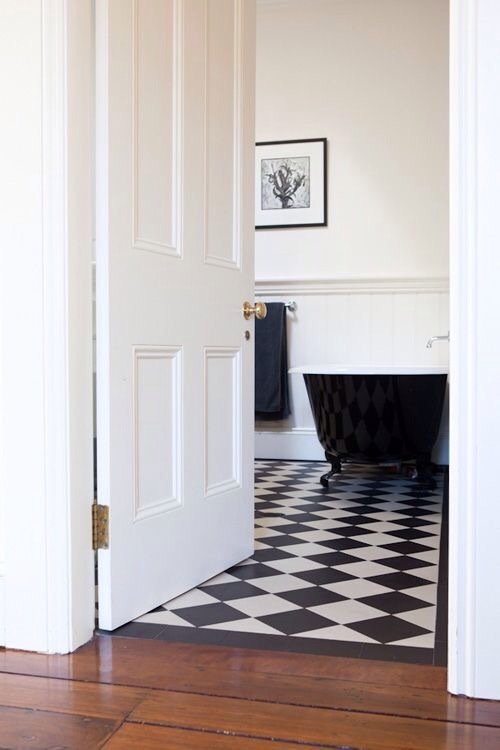 up into my beautiful black and white bathroom. 4) I had to LOVE it (cuz we aren’t going through this again!). No trends in this room. 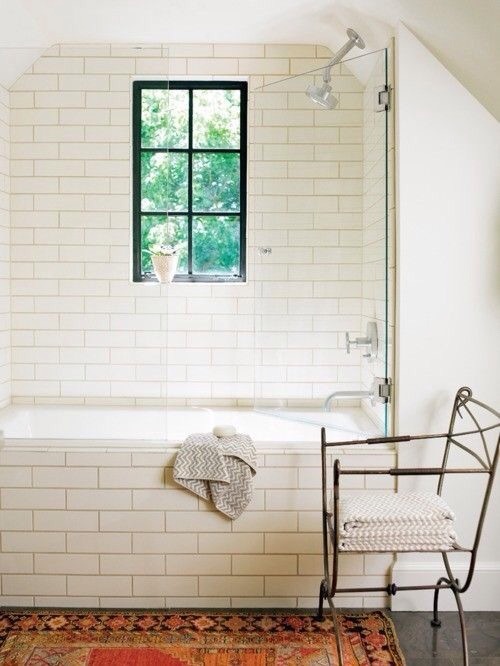 Bathrooms are way to expensive for trends. Strictly classic design. That was my goal. You’ll have to let me know how I did after next week’s post.